As well as new tunnelling, the project also involves the integration of a number of existing lines, particularly to the east and west outside central London. It has already started to open in stages and will be fully operational by 2019, at a cost of over $31 billion. The Elizabeth Line is projected to carry 200 million passengers annually when fully operational, with a train in the central section every two and a half minutes in peak hour, increasing central London rail capacity by 10%. The Sydney Metro will be 66 kilometres in length when completed, with over 30 kilometres of new tunnels and 13 kilometres of upgraded tunnels. It will run from Tallawong (formerly known as Cudgegong station) in the northwest then under Sydney Harbour and through the city to Bankstown in the southwest. When fully completed there will be 31 stations, all accessible, with 15 new stations and the rest upgraded. Of these, six will provide interchange with existing rail services, and two with light rail. Like Crossrail the project will involve both new tunnels and the integration of existing lines. 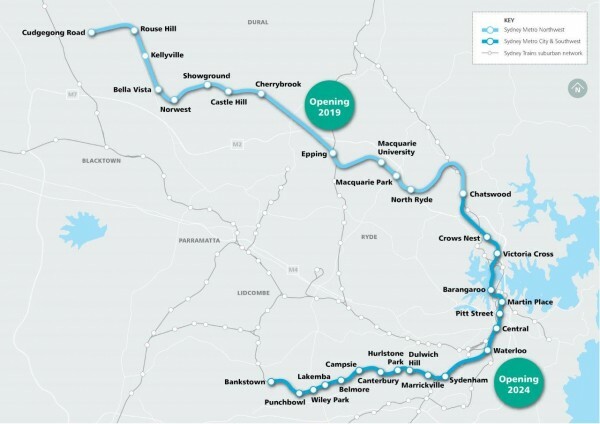 The line is being built in stages, with the first, Sydney Metro Northwest, also due to open in 2019. The second stage, Sydney Metro City and South West, is due to open in 2024. Total cost is estimated to be around $19 billion. When fully open the Sydney Metro will have a target capacity of around 40,000 passengers per hour (though potentially up to 46,000 per hour). Trains will then run every two minutes in peak hour and the line will increase the capacity of the city’s rail network through the CBD by 60%. The discussion above demonstrates some of the similarities between the two projects. Both involve combining massive tunnelling projects with upgraded existing lines to improve links between outer suburban areas and each city’s centre, as well as substantially increasing the capacity of the overall rail networks through the central area. Each line will also integrate with a number of existing rail lines and services, though in both cases several potential interchanges have been avoided to reduce the number of stops and provide a faster service. There are some other similarities operationally, with comparative train frequencies and passenger capacities. Both train fleets provide broadly similar features in terms of accessibility (including spaces for wheelchairs, prams, etc), real time information screens, air conditioning and other features. Each line’s train cars have three sets of doors on each side – and will provide seats for only about a third of total passenger capacity. There are also some interesting differences between the two projects. In terms of construction cost and overall length Crossrail is the bigger project, though the Sydney Metro actually involves more tunnel construction (30km compared to 21km); when complete nearly two thirds of the Sydney Metro will be in new or upgraded tunnel, compared to less than 20% of the Elizabeth Line. It has to be said however that while tunnelling for each project is undoubtedly complex, the challenges of constructing a new underground line through central London probably outweigh even those involved in tunnelling under Sydney’s harbour and CBD. Another point of difference is that while both projects integrate several existing lines, the Sydney Metro, unlike Crossrail, involves extending a new line into outer suburban areas as well as through the CBD. Conversely, while the two lines are broadly similar in capacity, the Metro will have a much bigger impact on increasing Sydney’s overall CBD rail capacity than Crossrail will in London. This is because Sydney has only a fraction of the number of existing CBD and inner-city lines and stations that London has. Another key difference is in the relationship of each line to the existing rail network. While Crossrail like the Sydney Metro will have its own dedicated fleet (the former will involve nearly twice as many rail cars as the latter), its trains can venture onto the existing rail network with relatively minor modifications to infrastructure. 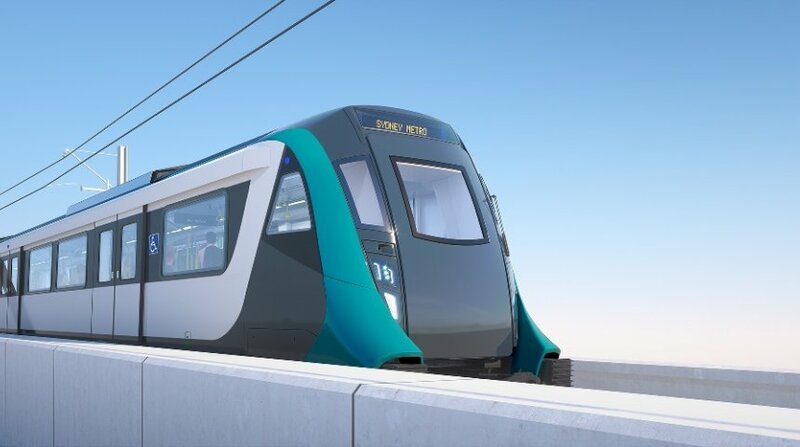 The Sydney Metro is however completely incompatible with the city’s existing rail system, which means that both the existing lines to be taken over for the Sydney Metro will require extensive conversion. Like Crossrail (but unlike all current Sydney trains) Sydney Metro trains will be single-deck. This means they are considerably smaller than Sydney’s current rolling stock while on the other hand Crossrail trains are physically larger than London’s existing tube trains. Seats on the Sydney Metro are entirely longitudinal, while Crossrail trains will have both transverse and longitudinal seating. Despite this the capacity of rail cars on both lines is broadly similar. 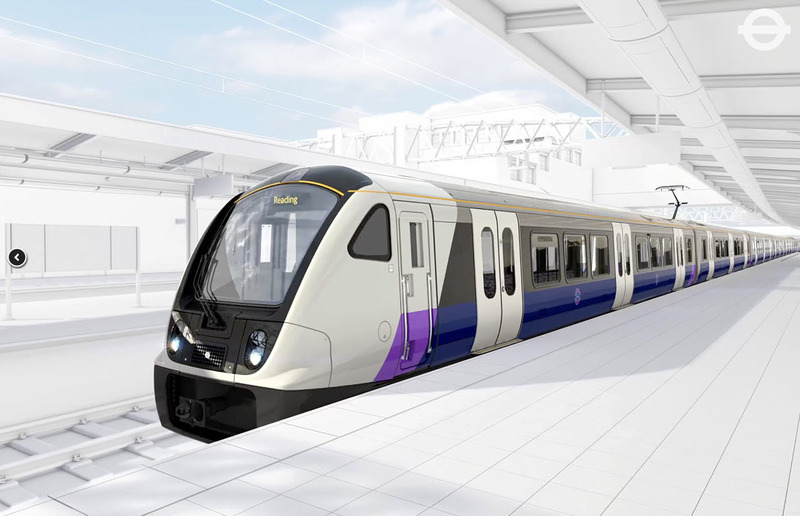 However, because Crossrail will have nine cars each when the system is fully operational, they will each carry more passengers than their six-car Sydney Metro counterparts. Potentially this difference will disappear if and when the latter line moves to eight-car trains. And of course, the biggest difference of all will be in operation. While the Elizabeth Line will be partially automated its trains will all have drivers; meanwhile the Sydney Metro will be fully automated and completely driverless from the first day it opens. In this respect the Sydney Metro may have a much bigger impact on its host city than its London counterpart. This entry was posted in Public Transport, Sydney metro area, Western Sydney and tagged Infrastructure, metro, NWRL, Rail, SWRL, Transport. Bookmark the permalink.